On August 5 2008, Madonna’s Give It 2 Me was released as a 8-track CD maxi-single by Warner Bros. Records in the U.S. 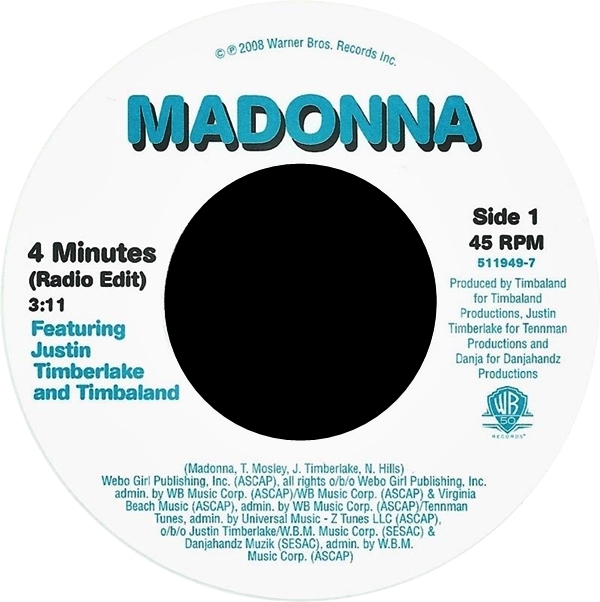 It included amazing club remixes by Eddie Amador, Paul Oakenfold, Fedde Le Grand, Tong & Spoon, Jody den Broeder, as well as a ragga version of the song by Sly & Robbie. On August 2 2008, the second single from Madonna’s Hard Candy album, Give It 2 Me, debuted at #2 on the Hot Dance Singles Chart in the USA. The single would go on to spend 3 non-consecutive weeks at #1. Madonna’s Hard Candy continued the electronica-oriented, disco-centric vibe she began with Confessions on a Dance Floor, and Give It 2 Me, the album’s second single, is a case in point. 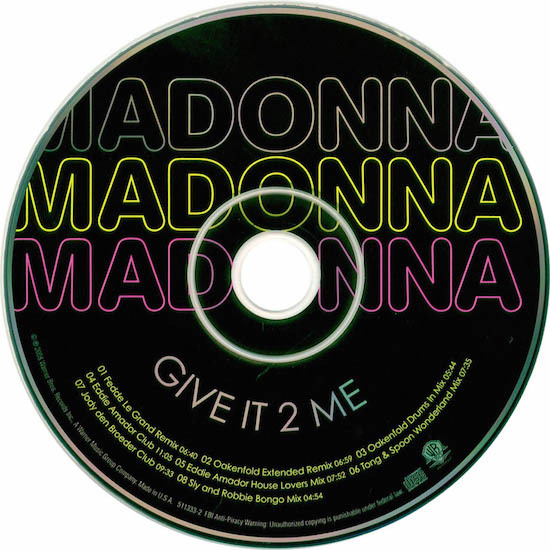 Co-written and co-produced by industry heavyweight Pharrell Williams, Give It 2 Me pulses, surges, and sashays with all the pop smarts that her fans expect from Madonna. 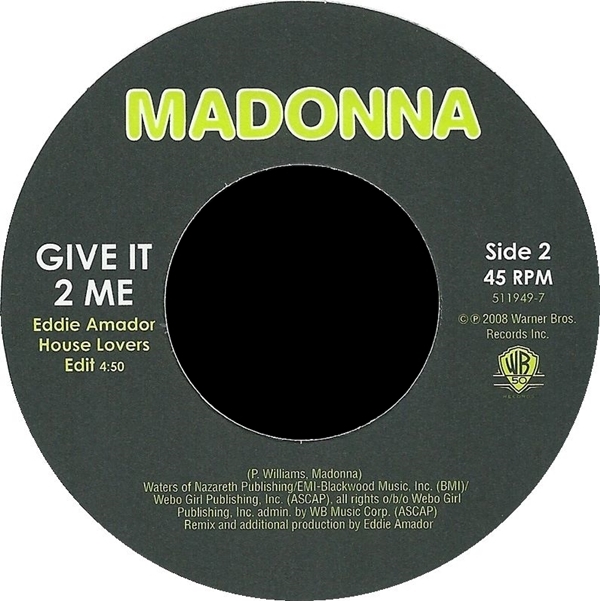 The Give It 2 Me maxi-single contains 8 remixes of the song from artists as diverse as Paul Oakenfold, Freddie Le Grand, and Sly & Robbie (whose dancehall interpretation of the track truly takes it someplace new). 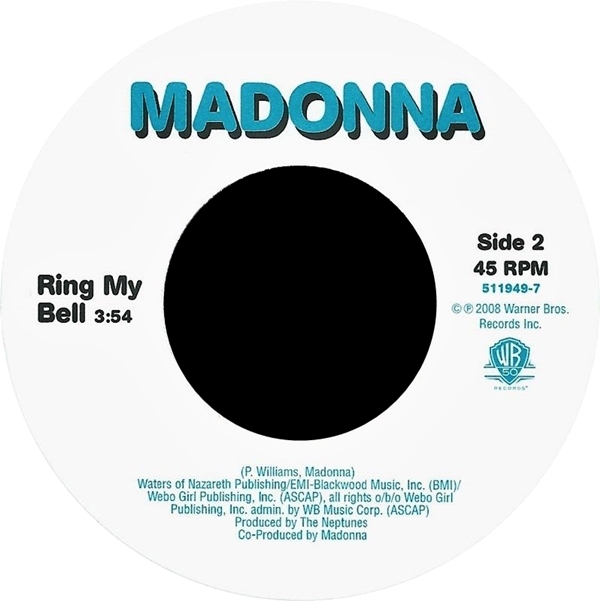 The remixes highlight the song’s incessant danceability, and should have any Madonna fan, especially those of Hard Candy, gyrating with pleasure.